This is what I got. 44 MB that has sat for the past 3 years after being restored by my dad. It has done about 7000 miles since restore. It has been handed onto me and now sits infront of my regular drive car, Everyday I come home I think I wish I could get that going, I would have so much fun with it. Mmmmmm. Anyway ANZAC day is coming again and that is more motivation to get it going. Well it was running really bad when it was garaged 3 years ago. I have got as close as getting it to idle for about 15 seconds before it cuts out. If i try to give it some gas it stalls. It runs long enough to set the timing and have that pretty close. After it stalls it wont start again until its cold?? I think it is over fueling?? If I screw the mixture screw all the way in, it doesnt stall? I have had the carby apart a few times so now I could have many problems, lol. There is no one I can find in Australia that know as much with carbys as this site. Maybe its the carby?? not sure. Gone over the ignition system many times. Just to change topic, how do u plug in a vacume gauge if you dont have vacume wipers?? Please outline your cold start procedure. 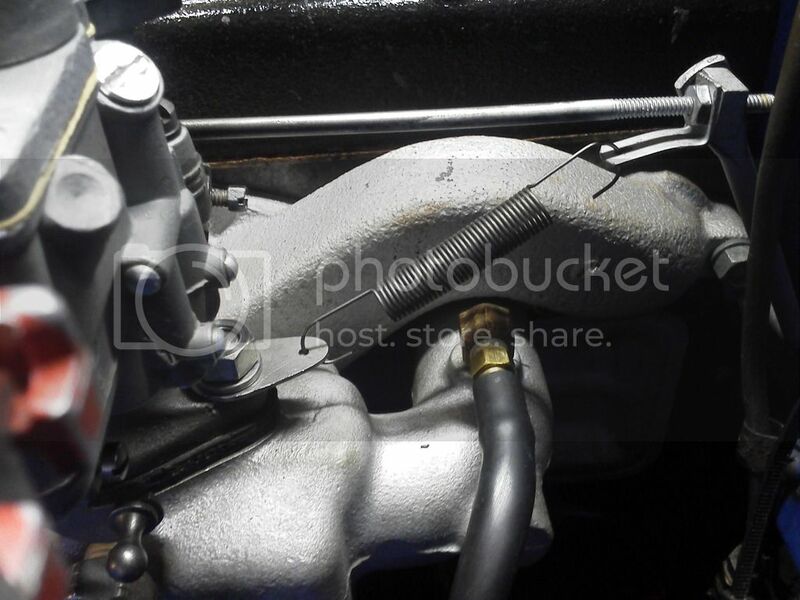 For your vacuum connection look over the intake manifold for a drilled/tapped/plugged port either on the top of the manifold between the carb and the firewall, or check both corners for the same. Install a brass barbed fitting at any of these locations. Do not use the port in the throttle. Intake manifold vacuum is what needs measuring. Let me know what you come up with. I just pump the throttle twice and is starts. Today it only ran for 10 seconds and wont start again. But I did notice quickly the vacume was reading 15?? I will try to up load some photos too. Looking at my carby the metering rod is bent quite bit, after watching your video ill take the crby off again and look at it. The mixture screw is bit strange. In the photos the carb is wet. Is that it’s usual appearance or did you just spill gas when you removed it? The amount of fresh liquid on the manifold concerns me. The carb may be flooding. If it has been many years since the last rebuild it may be time again. The float needs to be set at 3/8” without the gasket in place. The accelerator pump should be set for a stroke of 17/64”. The metering rod should be set at 2.718”. The vacuum reading of 15-Hg bothers me as well. How much play (wiggle) is there with the throttle shaft in its bores? You may have a vacuum leak. In order to keep the motor running do you need to keep the choke closed, even when warmed up? Can you not maintain an idle of 650-700 RPM, but must run it higher just to keep it running? If so, these are symptomatic of a vacuum leak. With a substantial vacuum leak the mixture screw is no longer effective. Not sure if it is usually wet looking, due to since I have owned it, it hasn't run. The Carby was rebuilt by my father many years ago, and it was the first Carby he ever played with and he isn't really mechanically minded so I don't know what he adjusted?? The throttle shaft seems ok, no real excessive play. I tried tighting the manifold early in case of a leak, but my problem is it still wont run for more than 15 seconds, even if I try to accelerate, it has like a huge dead spot. Thought it would run with a manifold leak, just run badly and need throttle to keep going?? I have watched you metering rod videos a couple of times but I don't have he correct tool and carter isn't a big selling Carby in Australia so, parts are hard to come across, especially special tools. Can I make one if I have the correct length?? Maybe just bite the bullet and send it off to you?? Do you return post to Australia?? I would like to learn how to do it but maybe now isn't the time. Thanks for all the advice. I will play again tomorrow and see how I go. Back to work on Saturday so after that I won't be doing much for 4 days til days off again. I followed your video for the float level using a drill bit and worked great but same problem. Pulling the choke closed doesn't help either. The throttle shaft and bores wear into an ‘egg’ shape over time. A gap of .005 will give it a vacuum leak. Although it is possible one or more of the jets and valves could have been installed incorrectly in the wrong passages. If you want to make your own metering rod gauge look over the following photos. If you go to the effort of rebuilding it yourself disassemble the throttle and measure the shaft and bores. New for each is .3125” ID for the bores and OD for the shaft. Believe me it does fit and work. 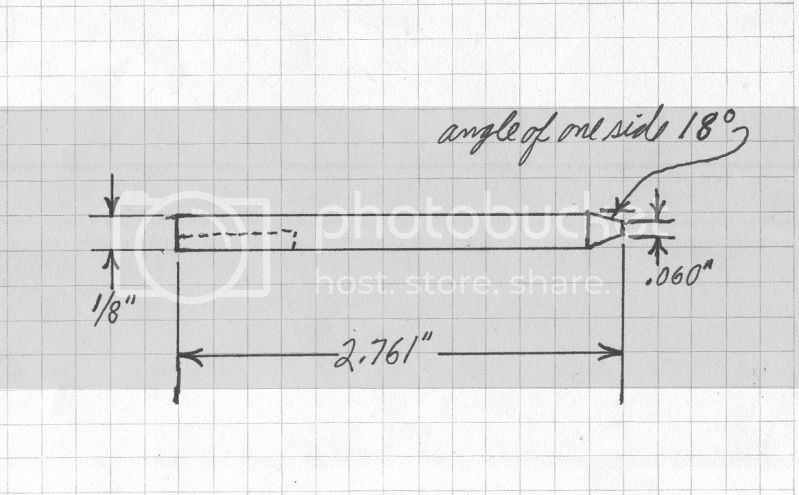 A shaft measuring less than .309” at any point, measure at several locations around the circumference, is bad. Bores measuring more than .3130” need bushings. CAUTION. Disassembly of the throttle requires that you inspect the tips of the throttle plate screws to determine if they have been split. If so, you will have to cut the tips off to avoid breaking the screws at the head which leaves you with a shaft that is now unusable unless you know a good machinist who can extract them and can not be removed without damage to the throttle. If you determine that it is too much yes, I have clients all around the world. I ship wherever they are. Keep me posted on your progress. Just had another play and the fuel is coming out of the throttle shaft, engine side. But I may have flooded it and been over excited by the accelerator pedal. If the metering rod is out of adjustment will this make it not run or flood?? The float level is correct! You may have dirt or grit lodged between the needle and seat. 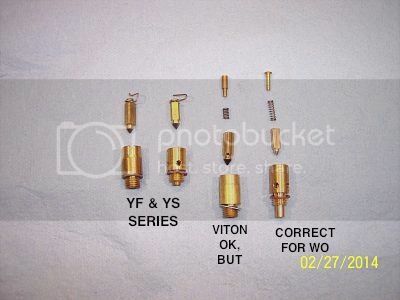 Is the needle solid brass or does it have a black rubber tip (Viton)? I’m not at all fond of the Viton tip as it will sometimes deform and allow gas to continue to flow causing just the symptom you’ve described. Which do you have in the carb? Beyond that, the accelerator pump may be worn beyond its ability to control the secondary fuel flow an gas is leaking past it. Third, a question. Does your heat riser work correctly? I’m considering the possibility that your carb may be worn out and due for a complete rebuild. I removed my PCV valve to clean it and found it just has a hole straight through it and no valve, is this right. I tried to upload a photo but something is playing up. Another night shift and I will be back into working on it. Just on a side note a friend at work has just inherited a jeep with a heap of accessories and want to get ride of all the double stuff. Can I post some pictures somewhere so I can get an opinion on what is good?? An empty PCV valve is a useless PCV valve. If you have no luck finding a replacement, let me know. On the other hand, your friend with the spare parts may have a good one. If you want to post some photos of the parts, do so here in this thread. As well, it wouldn’t hurt to post them on other sites like G503 or CJ2A Page. Found a box of Corby bits too. Don't know why new parts weren't fitted?? Photo #1. Wrong needle. Correct seat. The float pin is probably worn out. Check it for grooves. 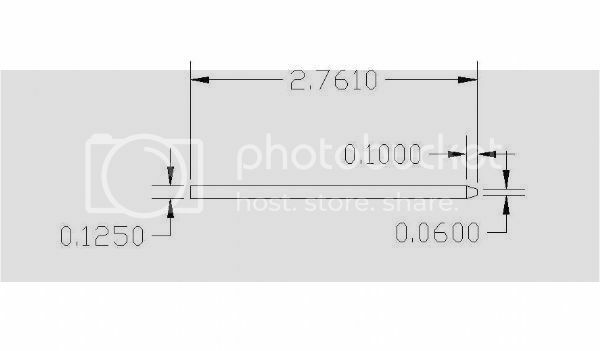 Worn float pins will cause the float setting to vary in operation. Moreover, if the holes in the float post are worn, that will exacerbate the problem. When I’m checking the float height I’ll bounce the float and measure again. I’ll do that a few times to be sure. The only reliable source I have found for pins is Mike’s Carbs. Finally, it must be the camera angle because to my eyes the metering rod does not appear to be perpendicular to the bowl cover as it should be. Photo#2. In my experience I have encountered many carbs that had old and new mixed because some parts, like the Idle Well Jet, were overlooked and had new installed on top of them or the jet or valve was in too tight and was just left in place with the hope that it would work. Could I just use a 1/8 drill bit cut to size for a metering rod tool?